Who invented the Ice Cream Cone? The name of the person credited with inventing the Ice Cream Cone is Italo Pietro Marchioni (1868 - 1954). Italo Pietro Marchioni is not only famous as the Italian-American inventor of the Ice Cream Cone but also as a chef and businessman. When was the Ice Cream Cone invented? Italo Pietro Marchioni invented the Ice Cream Cone in 1896, during the Second US Industrial Revolution / Victorian period of invention (1850 - 1914). The invention of the Ice Cream Cone originated in America and is considered an enjoyable addition in the area of Food and Drink. Definition of the Ice Cream Cone: The Ice Cream Cone is defined as a thin, crisp, hollow conical wafer, called a cornet, for holding one or more scoops of ice cream enabling the dessert to be eaten without a bowl or spoon as a portable treat. Fact 1: Who invented the Ice Cream Cone? The Ice Cream Cone was invented by Italo Pietro Marchioni in 1896 during the Second US Industrial Revolution era of inventions (1850 - 1914) which was a highly important addition to advancements made in the area of Food and Drink. 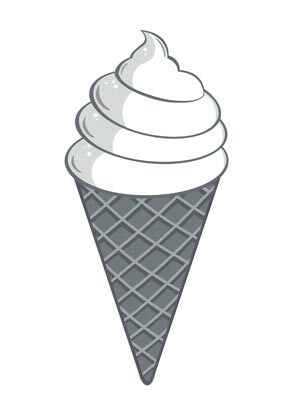 Fact 2: Who invented the Ice Cream Cone? Prior to the invention of the Ice Cream Cone in 1896, icecream was only enjoyed as a delicacy at home eaten from a dish, there was no way in which it could be enjoyed 'on the move'. Fact 3: Who invented the Ice Cream Cone? The simple invention of the ice cream cone coincided with the Second Industrial revolution when people had more time for leisure at fairs and the great stadiums and recreational parks were being introduced - the perfect venues for people to enjoy icecream. The invention of the ice cream cone was simple but so effective. Fact 3: Who invented the Ice Cream Cone? The inventor of the Ice Cream Cone, Italo Pietro Marchioni, was born on 21 December 1868 in Peaio, Veneto, Italy and died on 27 July 1954. Fact 4: Who invented the Ice Cream Cone? Ice Cream was invented by the Ancient Chinese, and later enjoyed by the Persians, Ancient Greeks and the Romans. It was said to have been introduced to Europe by Marco Polo, following his travels to China. Icecream became a popular delicacy for European royalty, the wealthy and the elite. Fact 5: Who invented the Ice Cream Cone? The Italians invented gelato, a rich ice cream, made with eggs containing a relatively low amount of butterfat. Immigrants to the New World took their recipes for icecream to America where it was also a highly popular dessert. The first ice cream machine was invented in 1686 and the first icecream maker was invented in 1843. Fact 6: Who invented the Ice Cream Cone? The first commercial icecream factory was opened by Jacob Fussell in 1851 and in the 1870's America saw the emergence of soda fountain shops as ice cream became less expensive and more popular. Fact 7: Who invented the Ice Cream Cone? In the late 1800's icecreams began to be sold by street vendors. They were sold in serving glasses called "penny licks" (they cost one penny and the ice cream was licked from the glass). The problem was that the serving glasses were easily broken and many people walked off with them. The problem was addressed in 1896 with the invention of the Ice Cream Cone by Italo Pietro Marchioni. Fact 8: Who invented the Ice Cream Cone? The early years of Italo Pietro Marchioni were spent in Peaio, Veneto, Italy where he was raised by his family. Italo Pietro Marchioni received a basic education and immigrated to America settling first in Philadelphia and then in New York. Fact 9: Who invented the Ice Cream Cone? Italo Marchioni opened a cafe selling ice cream and waffles in New York city. Icecream was often eaten with small cakes and waffles and Italo Marchioni had the idea of rolling out one of his waffles into the shape of a cone, letting it cool, and then putting the icecream inside. Fact 10: Who invented the Ice Cream Cone? The word Cone derived from the Latin word 'cornucopia' meaning "horn of plenty". In America, the cornucopia was associated with special occasions such as Thanksgiving , and consisted of a hollow, horn-shaped wicker basket filled with various kinds of festive fruits. Fact 11: Who invented the Ice Cream Cone? The invention of the Ice Cream Cone led Italo Marchioni to expand his business as an ice cream seller and before long he was employing over forty push-cart vendors selling his cones filled with ice cream on the streets of New York City. The African American inventor and businessman Alfred L. ​Cralle invented the ice cream scoop in 1897. Fact 12: Who invented the Ice Cream Cone? On September 22, 1903 Italo Marchioni filed a patent for his invention of a special cup shaped mold and associated apparatus for making the Ice Cream Cone. The patent, number US 746971, was granted on December 15, 1903. Fact 13: Who invented the Ice Cream Cone? Whether by accident or design Italo Marchioni patented invention of the Ice Cream Cone coincided with a major event that would attract millions of visitors. It was the Louisiana Purchase Exposition, informally known as the St. Louis World's Fair. Fact 14: Who invented the Ice Cream Cone? The 1904 St. Louis World's Fair provided a host of scientific exhibitions and some new treats for the visitors such as cotton candy and the ice cream cone. There were approximately 50 ice cream stands and more than a dozen waffle stands at the St. Louis World's Fair. The combination of the waffle-like cone filled with icecream was called the "World's Fair Cornucopia" (it was later re-named as a cone in 1909). Fact 15: Who invented the Ice Cream Cone? The Ice Cream Cone became extremely popular following the St. Louis World's Fair and other icecream vendors began producing the cone. Italo Marchioni had received his patent for his invention of the cup shaped mold and associated apparatus but not specifically the idea of the cone. Fact 16: Who invented the Ice Cream Cone? Marchiony tried to protect his patent through legal channels but failed leading to other claims for the invention of the icecream cone, notably from Antonio Valvona, Abe Doumar, David Avayou and Ernest Hamwi. However, to this day, the name of Italo Marchioni is most closely associated with the invention of the ice cream cone. Fact 19: Who invented the Ice Cream Cone? Italo Pietro Marchioni died on 27 July 1954, leaving his wife Frances and six children. His memory lives on as the American-Italian inventor of the ice cream cone.